Screenshot taken from the Californian’s website. Our upcoming training seminar, Medical Interpreting as a Profession, was broadcast by the Californian, a newspaper based in Salinas, California, where the county government is located and the majority of residents are Spanish-speakers from Mexico. This area has a strong need for medical interpretation services, so this workshop allows us to provide a much needed and valuable program for the community. 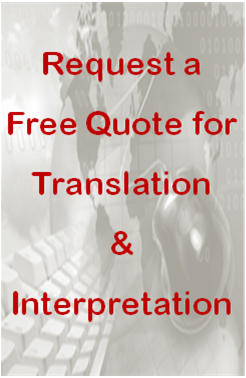 Our goal is to help bilingual speakers and interpreters enter the medical interpretation field. Download the workshop info and registration form here. 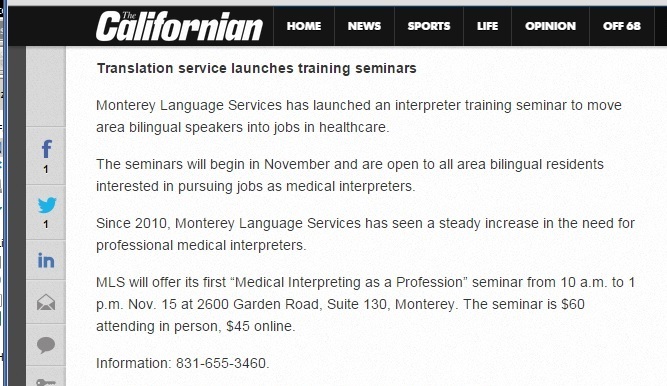 Monterey Language Services has launched an interpreter training seminar to move area bilingual speakers into jobs in healthcare. The seminars will begin in November and are open to all area bilingual residents interested in pursuing jobs as medical interpreters. Since 2010, Monterey Language Services has seen a steady increase in the need for professional medical interpreters. MLS will offer its first “Medical Interpreting as a Profession” seminar from 10 a.m. to 1 p.m. Nov. 15 at 2600 Garden Road, Suite 130, Monterey. The seminar is $60 attending in person, $45 online. Other than translation, Monterey Language Services provides interpreters to hospitals in Monterey and Santa Cruz counties and is the official bilingual evaluator for the County of Monterey. Our main services include interpreter training and certification as well.